It’s officially spring wedding season. I was never really into weddings until I became a bride myself, but now I’m so excited to attend them and see what my friends come up with! For the last wedding I attended, I tried to find an outfit at a few different Atlanta malls for the occasion. I never settled on one because I didn’t really want to buy a dress for an occasion I’ll only wear once. Granted, I have more weddings coming up, but I knew I wouldn’t want to re-wear the same dress to them because, #Instagram. I decided to go with my go-to combination pairing a top and skirt. Going with this lets you have so much more depth in your wardrobe because you can always pair them differently and I won’t feel like I’m re-wearing the same dress again. I can wear this top with white jeans, a different skirt, denim shorts in the summer, or even to work. By the way, I think you can get away with sizing down in this shirt. I’m wearing a small here but wish I purchased a xs. While I was at this wedding a few people asked me if I was wearing a dress or if it was two separate pieces. A friend said she has so many skirts but never the right tops for them and vice versa. So today, I wanted to share my tips and some inspiration to make the top and skirt combo work for you! Pick one that’s patterned: either the top or the bottom, but not both unless they’re the exact same print from the same line. 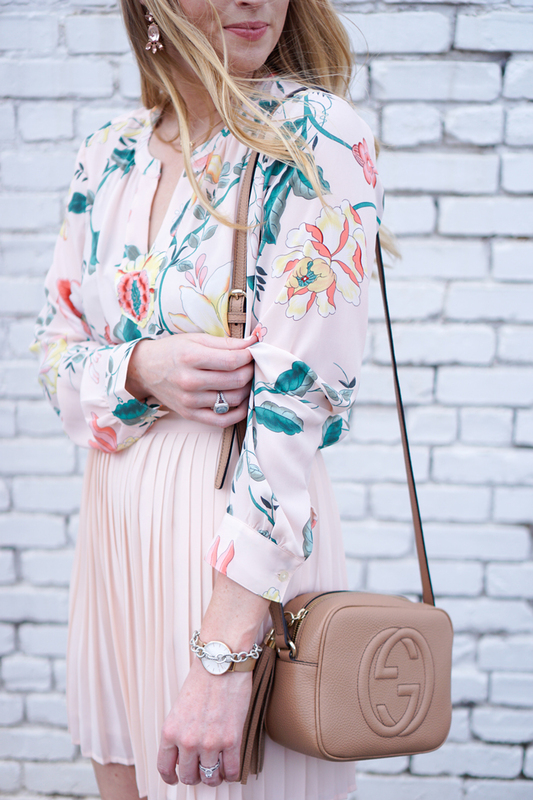 Florals are always a good option for a spring wedding. Find a skirt that fits higher up on your waist; I always wear skirts at the narrowest part of my waistline. It’s very flattering and doing so will also give you the illusion of longer legs! Tip: you may need to size down if you wear it at your natural waist. If you’re not sure, still try it on! I didn’t think this top would work with this skirt, but it was the best option in my closet so I tried it on and loved how it turned out. Always tuck it in to define your waist: I love this trick because you’re guaranteed some shape at the smallest part of your waistline. Tucking tip: I always pull my top down completely through the bottom of my skirt to take away some of the bulk at the waist. The only time I don’t tuck in the top is if I’m wearing a bodycon skirt and I want to cover my backside. If your shirt isn’t looking right, you can also try wearing a belt with it. Picking a skirt: Since it was a day wedding, I didn’t want to wear a pencil skirt because it would look too much like work wear. A midi skirt would have been cute, but it would have looked really unbalanced with this somewhat flowy top. I went with a shorter (but still wedding appropriate) skirt to give me a little more shape. I would definitely not recommend wearing a tulle skirt to a wedding, otherwise, I’m all about them. I wanted to buy this skirt for the occasion but it was online only and I wouldn’t get it in time. This is such a pretty outfit and a fun alternative to the traditional dress everyone wears to a wedding! I love the pretty blush pink! This outfit is so cute and your shoes are amazing!!! Such great advice on how to style the skirt and top together…and we all love a smaller waist 🙂 And, can we chat about your ankle straps…how ADORABLE are those?!?! Perfect amount of a bling to wear to a wedding!! Girl, this look is amazing. SO obsessed and love the skirt with this top! such a gorgeous look, I love those heels! Love the floral top! 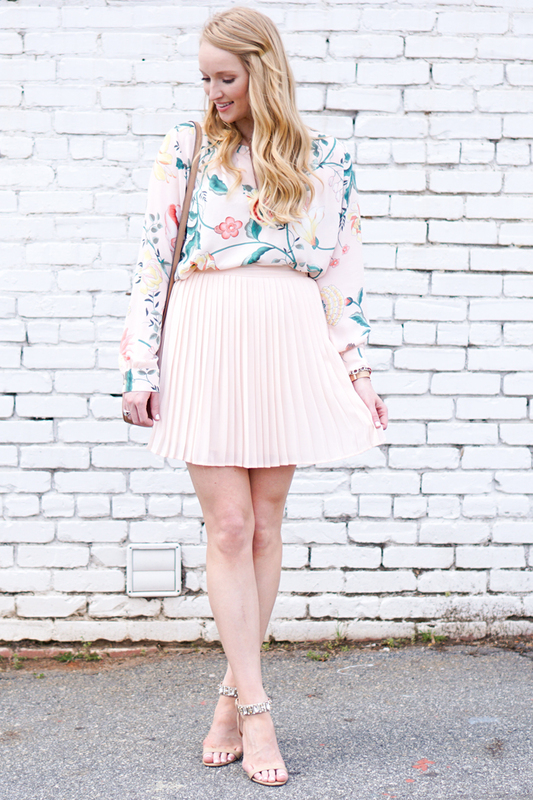 Such a cute spring look! This outfit is so pretty! Pastels looks really great on you! Love this look and all of your tips! These are great tips! I love how you styled your top and skirt. Both pieces are amazing on their own but they look perfect together. 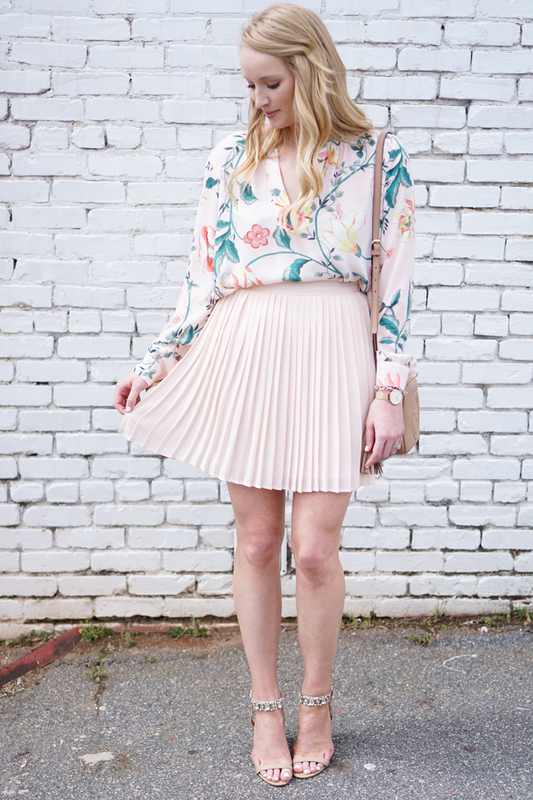 This is such a gorgeous spring outfit!!! This look is so pretty! Love your top!! I've been eyeing this top! 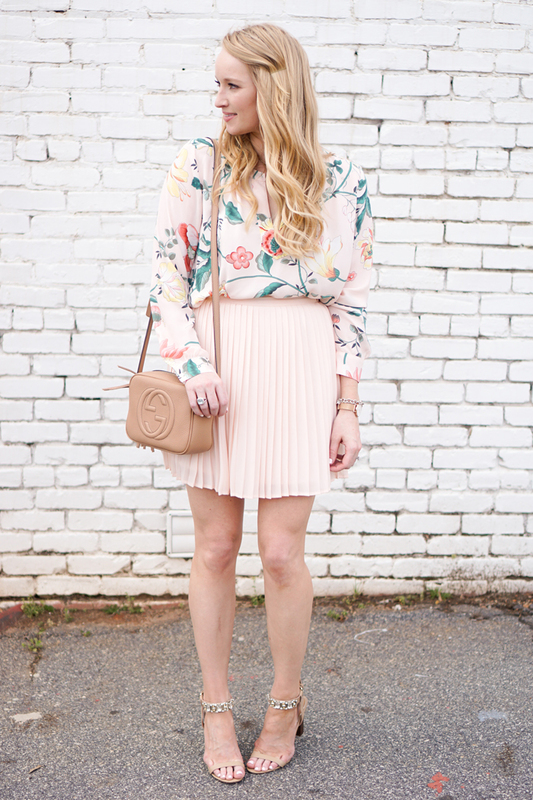 I love it styled with a blush skirt. So cute!